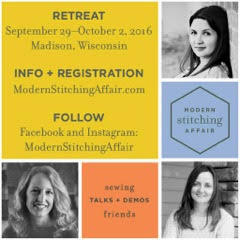 Eighty attendees will sew and socialize together in a large hotel conference center in beautiful Madison, Wisconsin. Three specially curated projects will be demonstrated by nationally known designers from Maryland, Arizona, and Eau Claire, Wisconsin. There will also be plenty of free time to sew your own projects. Betz White will be demonstrating her Field Study Tote. Cristy Fincher will teach her original technique, Piec-Lique with her Circle Maze Quilt Pattern. Ann Sandler will be releasing a brand new Hexagon Embroidery Sampler that she has designed specifically for our event. In addition, we will have vendors, generous gifts from our sponsors, optional swaps, and more. Check out our website for more information and register for the Modern Stitching Affair at www.modernstitchingaffair.com. Follow us on Facebook and Instagram: @modernstitchingaffair.